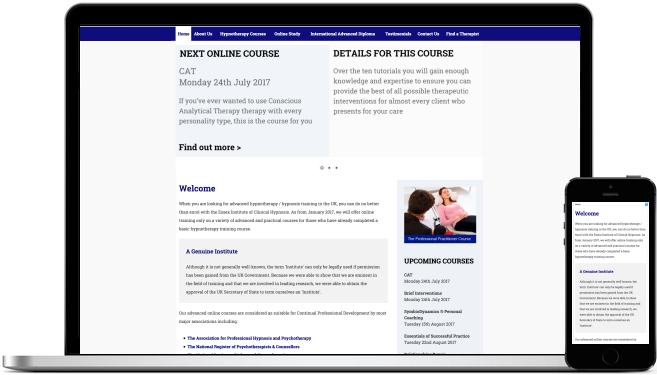 We were approached by a therapist trainer to re-design and update their website to be mobile-friendly and develop a booking system for their upcoming courses. We started with analysis to understand their needs. Their previous website wasn't mobile-friendly and their booking system was adhoc resulting in a lot of extra work by the admin staff to organise their courses. In addition, we determined the need for the website to be changed to focus on promoting their upcoming courses with the home page automatically showing the next course they are running. The website we delivered uses responsive web design, so it's mobile friendly and allows more people to see and use the website than before.